When an almighty government is at war with a section of its own citizens, the era is replete with so many horror stories. Governments use all the powers with them – legal, political, propaganda and financial – to project the other party which it fights with as villains. Thus, anything done by the Government to destroy the villain is justified. Many perish at the hands of governmental authorities leaving only sad memories. Of them, some important personalities stand up and continue to fight against the authoritative regimes even after death. Wijedasa Liyanarachchi, the lawyer who died in police custody in 1988, is one such personality. Wijedasa Liyanarachchi is only one case in Sri Lanka where a leading private citizen died in the hands of law enforcement authorities. Sri Lanka is not alone in committing such gruesome murders against citizens. In many parts of the world such abuse of human rights had happened in the past, is happening even today and will happen in the future as well. At the time of committing such felonies, the perpetrators are confident that they are far away from the long arm of the law. But history has shown that they resurface after many years and in many cases the perpetrators have been tried by specially established courts of law, if the ordinary court system is not powerful enough to handle them effectively. One such example is provided by the arrest and indictment of the Chilean dictator Augusto Pinochet who held absolute power in that country for 17 long years. General Augusto Pinochet seized power in Chile in 1973 in a military coup after deposing Chile’s popularly elected President Salvador Allende. At that time, Chile’s economy was in shambles but Pinochet was able to make a turnaround in the economy by getting a substantially high flow of aid from Western countries, chiefly the US. However, he has been charged with getting rich through “illegal arms deals” and “illegal drug deals”. On top of this, he was accused of eliminating his political opponents in the most brutal manner numbering some 2279 persons, according to a Chilean government appointed commission called the National Commission for Truth and Reconciliation whose report is popularly known as the Rettig Report, released in 1991. Amidst the mounting political opposition to his rule, he tried to extend his presidency by nine more years in 1988 by calling a referendum which he lost by 55 to 45. Eight years later after giving up power in 1990, in 1998, he was first charged in Spain under universal jurisdiction principles. He was arrested in the UK but released later to facilitate him to return to Chile on health grounds. He was charged again in Chile for murder but the case got dragged on till 2006 when he died due to a prolonged illness. Though he escaped having served a jail sentence, he lost his face, reputation and respect due to numerous charges preferred against him. However, 67 military officers who had collaborated with him in committing these crimes were convicted later. Thus, the long arm of the law reached Pinochet and his accomplices even after many years. In Sri Lanka, 27 years after the gruesome murder of Wijedasa Liyanarachchi, a forensic expert, Ravindra Fernando, Senior Professor of Forensic Medicine at the Colombo University’s Medical Faculty, has dug out the materials from their resting places and presented them to readers in the form of a book. 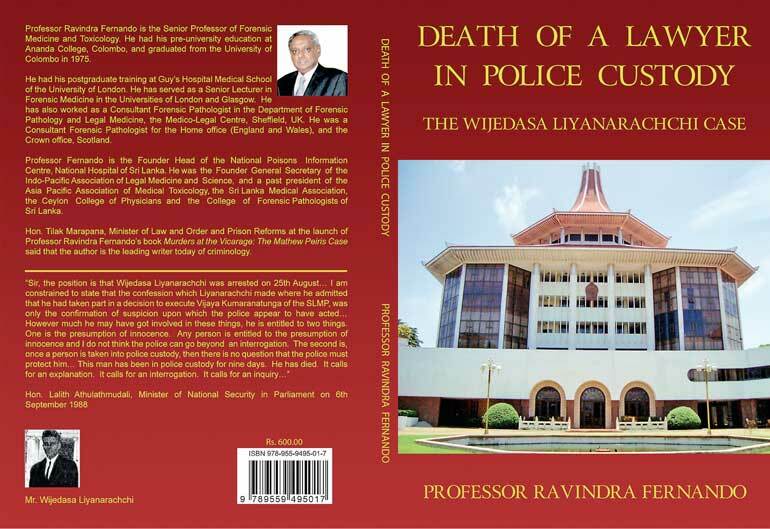 The book titled ‘Death of a Lawyer in Police Custody: The Wijedasa Liyanarachchi Case’ was released in Colombo a few weeks back. In fact, this is the third of a series of books which the erudite professor has been writing on important medico-legal cases that have baffled, shocked and intrigued Sri Lankans. The previous two books relate to the famous Sathasivam Case and Mathew Pieris Case. In all the three books, Ravindra Fernando uses his impressive writing skills to keep the readers in continuous suspense until they come to the very end of the book. Indeed, the case in question has all these bad qualifications: cruel, inhuman, degrading, torture and death. He had a particular interest in the case because he had to look after the interests of the Sri Lanka Bar Association as a forensic medicine expert and, therefore, was privy to firsthand information relating to what transpired in the investigations and the subsequent court proceedings. Yet, he has presented his case not on hearsay but on solid evidence which he has unearthed by digging into old records. The plot, as it was unfolded in subsequent investigations, is as follows. Wijedasa Liyanarachchi had been a junior lawyer working in the chambers of the famous criminal lawyer Ranjit Abeysuriya. He had been angry at the human rights violations being perpetrated and sympathetic of the youth who had been persecuted by the authorities on the charge of waging a war against the state. Thus, he had appeared in courts of law on behalf of them, for a very low fee. Naturally, as always is the case, it would have angered the authorities who did not wish civil society to question what they did and become a tumbling block in their fight against what they termed as ‘terrorism’. Hence, unbeknownst to Liyanarachchi he became hunted. The ugly arm of the law enforcement authorities touched him one day when he was coming out of the court house at Hulftsdorp, the supreme temple of justice in the country. He was abducted and transported to Tangalla, a local town located about 150 km to the south of Colombo. His abductors, as revealed later, consisted of SP, Tangalla, assisted by two police officers. At first, there was a complete blackout of any news about Liyanarachchi. His senior lawyer alerted all the law enforcement authorities but even the IGP was not aware of whether he had been arrested by the police. Later, it was revealed that the DIG in charge of the Southern Range had sent a radio message to police stations within his authority inquiring about whether a lawyer by the name of Wijedasa Liyanarachchi had been arrested and detained in any of those police stations. The answer had been in the negative. It appeared that the police had touched the wrong man in the wrong manner this time because it caused so much of agitation and protests in Colombo. The Bar Association, smelling foul play, began an all out protest and the authorities could no longer ignore the brewing discontent in civil society. Then, all of a sudden, Wijedasa Liyanarachchi surfaced in Tangalla as a terrorist suspect arrested by the police and held in police custody there. As if in an attempt at justifying the arrest, the state media, as usual, began publishing stories about Liyanarachchi chairing a kangaroo court that had passed death sentences on many noteworthy people at that time, including the actor-turned politician, Vijaya Kumaratunga. However, if the story were true, it itself should cause goosebumps in the political authority, since Liyanarachchi was not an ordinary terrorist suspect but someone at the top. It therefore threatened the stability of the Government and political leadership. Sensing the danger, the political authority ordered that he be transferred from Tangalla to Sapugaskanda claiming that it would make his life safer. Then all the hell broke loose, making Liyanarachchi even more powerful in death than he ever was when alive. The Bar Association took a tough stand, demanding an immediate investigation to bring the culprits to justice and unanimously resolved that none of their members would appear before courts on behalf of police officers. The writer, Ravindra Fernando, was engaged by the Bar Association to represent its interests at the post-mortem as an observer so that the authorities could not engage in any cover-up operation. It appeared that the Government was at war not only with the so-called terrorists but also with the intelligentsia and the professionals of the country. Surely, that was not what the Government would have expected. Ravindra Fernando explains in minute detail the tense situation that had engulfed the country at that time. In the post-mortem, it was revealed that Liyanarachchi had sustained over 100 body injuries, two rib fractures and damage to internal organs, clearly due to torture while in police custody. However, it was also revealed that he was not tortured after he was transferred to Sapugaskanda, implying that all injuries had been sustained while he was in Tangalla. Due to the mounting pressure from the lawyers and civic society organisations, the Government could not sweep it under the carpet. Accordingly, SP, Tangalla and the two police officers who had helped him to abduct Liyanarachchi were tried in court. The original charges included conspiracy to murder and then carrying out murder and conspiracy to illegal detention and then carrying out illegal detention. The trial at bar which heard the case acquitted them of the first two charges and found them guilty in the case of the latter two. Accordingly, they were ordered to pay compensation and were handed suspended prison sentences. In effect, the penalties did not affect their career in the police. The compensation for the loss of life was Rs. 55,000, Rs. 17,500 and Rs. 7,500 by the three accused. That was the value of the life of a human rights lawyer as determined by courts at that time. Economists have tried hard to give a value to human life. One cannot go by market valuation of life here because of the conflicting valuations done by the person possessing life and the others in society. For the person possessing life, the value is infinite. For others, it ranges from zero to a finite value. There cannot be a market determined equilibrium value for life as in the case of a commodity, say, coconuts. Because of these conflicting valuations and the inability of the market to give a proper valuation to life, legal philosophers have given powers for a person to self-defend his life even at the destruction of the lives of those who seek to deprive him or her of life. They also have established legal machineries to prevent the authorities from arbitrarily or illegally depriving the lives of citizens. As it happened in the good old days, as demonstrated by Emperor Asoka in the third century BCE, the right to life was extended even to animals. Today, with more informed societies, there is no reason to ignore the value of human life and the need for protecting life. The Wijedasa Liyanarachchi case was a big farce in Sri Lanka’s legal system though Ravindra Fernando has not said it directly. A man died at the hands of the police and all the forensic evidence showed that it was due to torture while in illegal detention. The courts have found even the people who are guilty of that illegal detention. Yet, there are no people who have caused that death. Investigators and courts have certainly failed in protecting the lives of citizens. The bad precedent created by the Liyanarachchi case has given licence to later generation politicians and law enforcement authorities to go on a free spree of depriving those who do not agree with their political machinations of their basic rights. All those who had agitated vigorously for Liyanarachchi forgot him soon. It was simply filed away as yet another instance of a human rights violation in Sri Lanka by the authorities. Since then, there have been hundreds and thousands of such cases which have been more gruesome, crueler and more inhumane. Hence, his case was a forgotten subject until Ravindra Fernando reopened it with his book. Ravindra Fernando explains why he wrote the book in the last two sentences of the concluding chapter. Says he: “This book would not have seen the light of the day if the JVP did not take arms in 1987. I fervently hope that lessons learnt from reading this book will help to prevent a similar human tragedy in Sri Lanka in the future.” On that count alone, it is a must-read.